Discover paradise at Karmina Palace. While staying at this resort, enjoy the specially designed cascades and fountains in the eight pools, all connected and surrounded by tropical gardens and Mexican flowers. 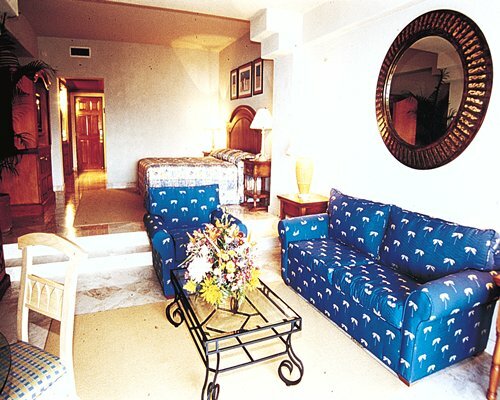 This 5-star property offers fully equipped luxury suites with everything necessary for a comfortable stay. Moreover, all rooms have a private terrace or balcony with excellent views of the tropical gardens or the ocean (subject to availability). The units have a Minibar stocked daily with water, juice, fountain drinks, beer & snacks.WIFI is available but with an extra charge. 24 Hour Room Service is also available for an extra charge. If golf is your game, Mantarraya Las Hadas golf course is next to the resort, designed by Pete and Roy Dye. Finish your game overlooking the water of the Pacific coast. Playa de Oro International Airport is 19 miles away from Royal Reef Karmina Palace. 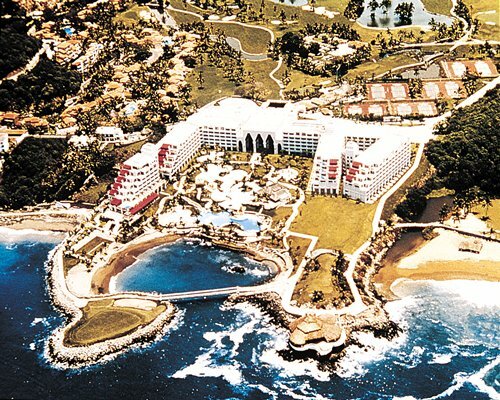 The resort is located on the sunny coast of Mexico on the peninsula of Santiago. It is recommended you take a taxi from the airport to the resort. If you are travel ing by car take the highway from Guadalaja ra to Manzanillo, the trip by car takes approximately 3 hours.